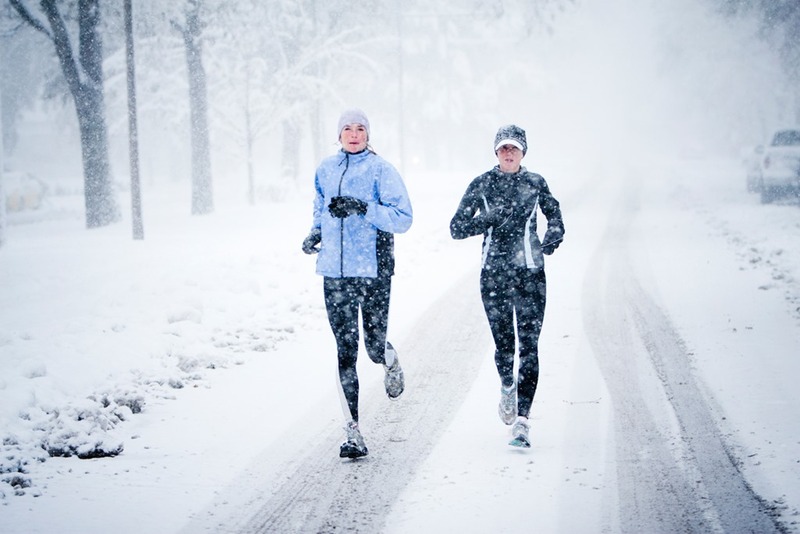 Marathon Training IN THE WINTER …..
How hard is it for you to stay motivated thru the winter? If you have a spring marathon on the calendar like the Garmin Marathon or the Flying Pig Marathon, then you don’t have many options other than to keep yourself moving. But that doesn’t mean you have to pound out the same hard miles, in the same hard way that you would do in the spring and summer months. Maybe change it up a bit and try something new? Something that might get you out of the cold and onto the treadmill or indoor track when the wind chill slips below zero or the snow is flying so hard that those oncoming cars can’t even make out your reflective vest? Don’t get me wrong, I love my snowy runs but I can’t run a quality workout when I have to worry about my footing. So I save my easy, fun, social runs for outdoors when the snow is flying. Then I take my hard, fast runs inside where it’s safer. 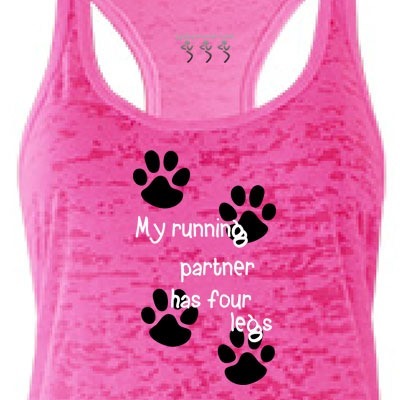 I also shorten my training cycle and lower the number of days I run each week. I focus on power and speed and strength. This does a few things. 1) Helps me to avoid burnout. 2) Makes me FOCUS on the runs that I have on the schedule each week. 3) Allows me some free time for cross training and/or weight work. Winter workouts are important. 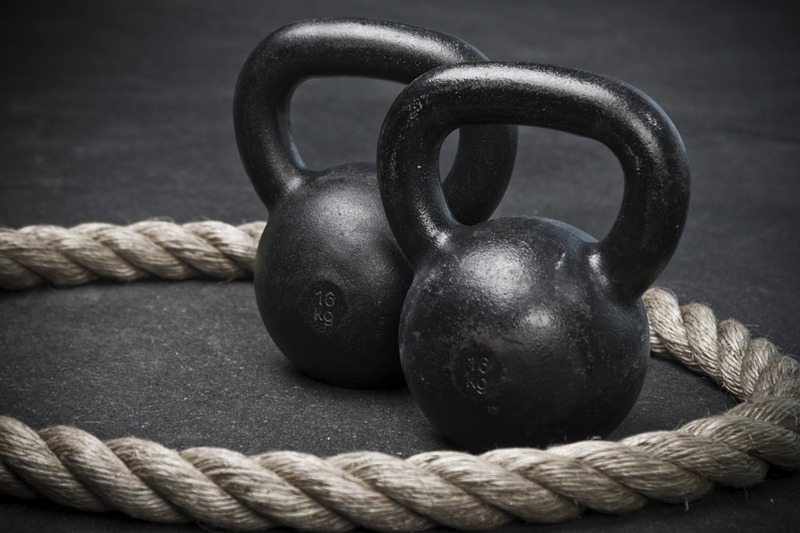 This is the time to work on the areas of your fitness that need extra attention. Strength? I need more of this and it’s definitely something I’ll be focusing on this winter. My goal is 2 strength workouts each week. 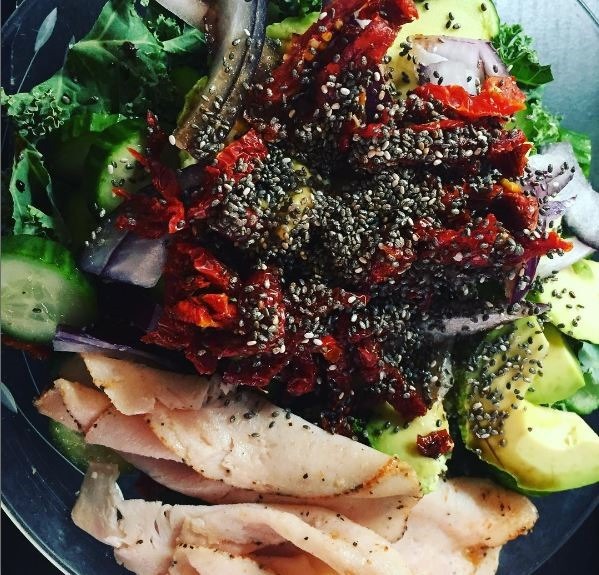 Nutrition? How is this going for you? I was doing GREAT before the holidays. I had lost 12#s, then I got sick, did the holidays, ran a 50K & a couple marathons, now I’ve gained 5 of those lbs back and am facing down 16#s which I need to lose before I crush the Garmin Marathon in April. So part of my winter marathon training is focusing on my nutrition AND making sure I am getting adequate water intake each and every day. Lean proteins. Fruits & veggies. Healthy fats. Whole grains. 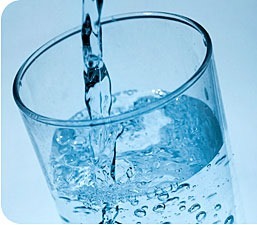 Water. Rest? You betcha! I’ll be honest; I’m tired. So freaking tired. I know I’ve ran a lot of miles lately but I’m also just a poor sleeper. And I’ve been sick. I’m definitely run down in more than one way. I’m good about getting my vitamin c and other vitamins that help strengthen my immune system but nothing makes up for sleep. Maybe the winter nights are longer for a reason? Take advantage of the darkness and get some extra shuteye. 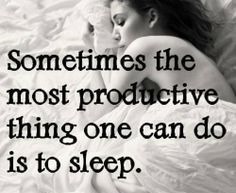 Sleep repairs your muscles, helps build your immune system and makes you feel better! Don’t skip the sleep or you’ll pay for it later. This week I’m dragging. Do I need to swim in the mornings? Yes. Do I need to rest more than I need to swim this week? Yes. So I’m sleeping in and I’ll worry about how fast (or slow) I swim next week. Priorities. Marathon training is about so much more than the miles you log. As you age, you may also notice that your body just can’t take the pounding that was once the norm. That’s when you start to develop aches and pains that lead to injuries OR you can shuffle the deck and change the way you train. Change can be for the better. I’m mixing things up this winter. I’m going to step back on my miles a bit and focus more on quality. One long run, one tempo, one speed. I’ve mentioned it before but I use the FIRST Run Less Run Faster app on my iPhone to plan my workouts. It was a $2.99 download but I’ve used the program so many times that it’s paid for itself. This certainly won’t replace a coach if you can afford one but a coach isn’t in my budget, a $2.99 app I can justify. I’m looking forward to picking up the pace this winter. It’s always hard for me when I start this plan. I can never hit the numbers initially but as I build strength, speed and confidence, I’m always amazed at where it can take me. 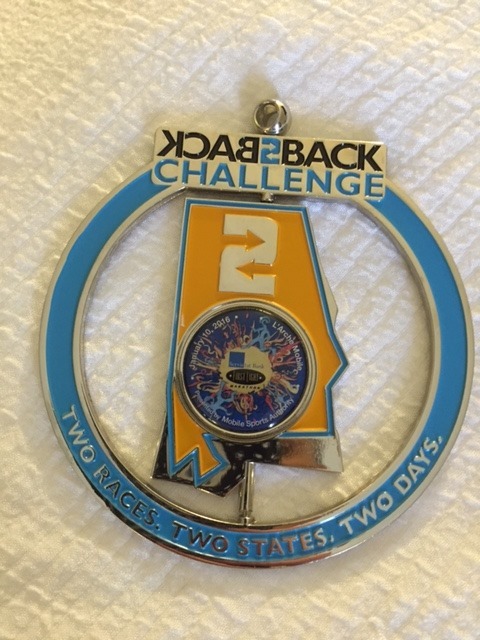 Day 2 of the Back2Back Challenge was the First Light Marathon in Mobile, AL. I had heard of Mobile although I didn’t really know where it was located on the map. Turns out we had a 3.25 hour drive southeast from Jackson MS to Mobile AL. Not too bad. 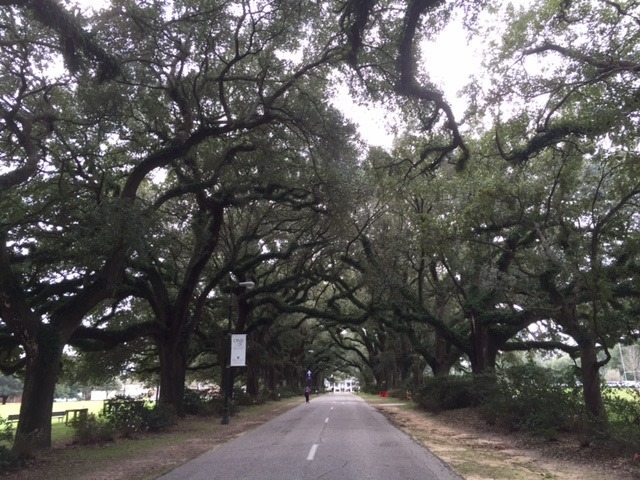 Then we drove into the charming town of Mobile. What a nice surprise. The expo was in the Mobile Government Center, maybe 2 blocks from our hotel and the Start/Finish area. It was a small expo, even smaller than MS Blues. But there were a few local running & TRI stores that set up booths. One had clothing 75% off and I snagged a cute Nike tank for $8.95!! Everyone was super friendly. 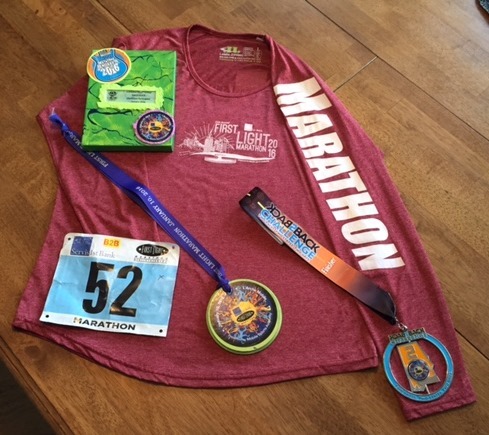 We were presented with long sleeve gender specific tech tees, plus our Back2Back Marathon Participant Award which was hand crafted by a member of L’Arche Mobile, a community of people serving those with intellectual disabilities in the area. I was very touched by this. I can’t imagine how long it took to make all of these canvases. I later found out that our finisher medals were also created by the members of L’Arche, some of whom were at the finish line to greet us. See my Back2Back partipant award below. 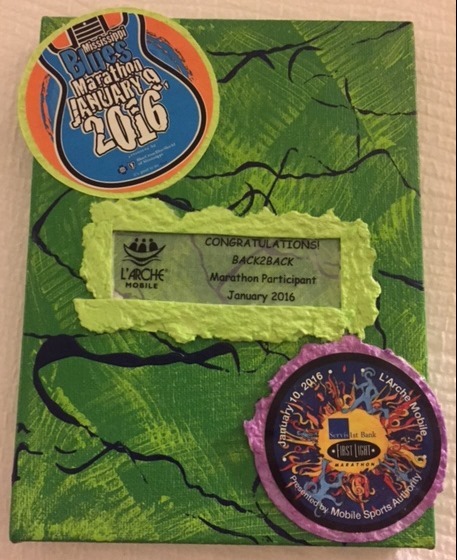 Each award was unique and hand crafted by a different member of L’Arche. Lucy took the time to make this one for me, her story is below. 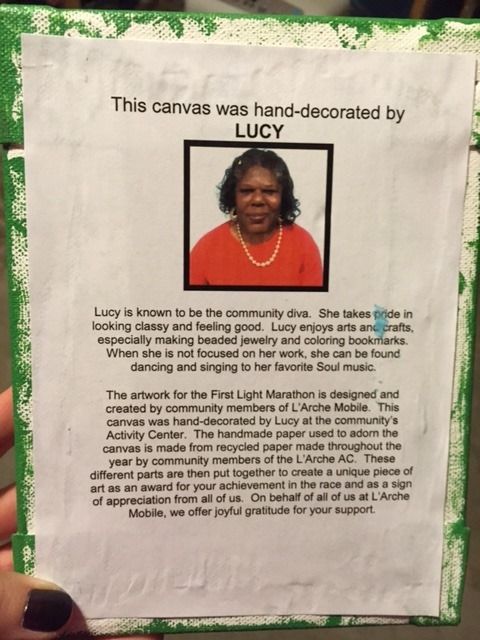 Thank you, Lucy! We were in and out of the expo in a flash, then off to dinner. Mobile is the type of town that I love. We parked at the hotel, walked to the expo, then walked to dinner on Dauphin Street. We never traveled more than a 3-4 block radius from the hotel but had everything we needed. This would be a good race to go to and stay for an extra day or two. Plenty to do on Dauphin Street with shopping, eating and drinking establishments lining the way. Race Morning. We waited in the lobby of our hotel til 5 minutes before gun time, then we walked out the front door onto the start line. Yes, it was that easy. The town was in Mardi Gras mode. Mobile claims to be the birthplace of America’s Mardi Gras and the town and our hotel were decorated and ready for the upcoming season (which begins on Feb 9, 2016). 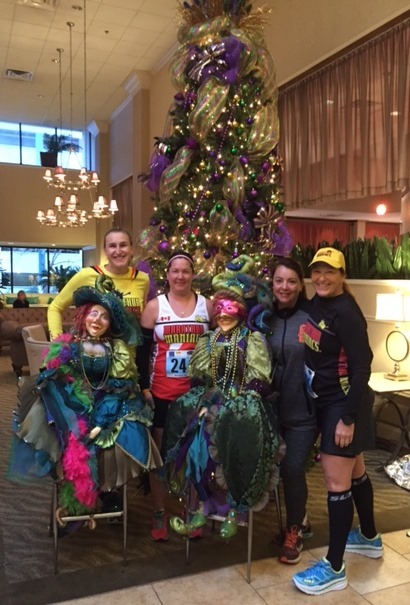 On race morning we posed by the Mardi Gras “ladies” and tree in our hotel. Me, Julie, Laura & Judy. The race started on time with very little fanfare. Very small race and it seemed that the majority of people on the start line were Marathon Maniacs who had come from MS Blues the day before, in hopes of conquering the Back2Back Challenge. 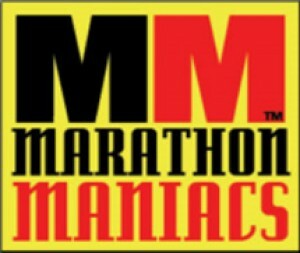 In total, there were 376 marathon finishers and 743 half marathon finishers. There was no “crunch” at the start like the day previous. Everyone seemed to be laughing and in good spirits even though the temps were cool for the area (low 40s). Most of the crowd was stiff and sore from the day before so everyone started slow and with some sort of hobble in their step. It was all very relaxed and a fun atmosphere. To be honest, I really didn’t expect much from a race this small. But I was quickly surprised. The course started with a tour thru the Historic Garden District where we saw home after amazing home with Historic Landmark placards. Many decorated full scale for the upcoming Mardi Gras season. It was beautiful and put a smile on my face from the very first mile. The rest of the course did not disappoint either. It was flat (thank you, First Light) til mile 9, then we had a few rolling hills and a gradual beastly incline going up into the University of South Alabama campus. 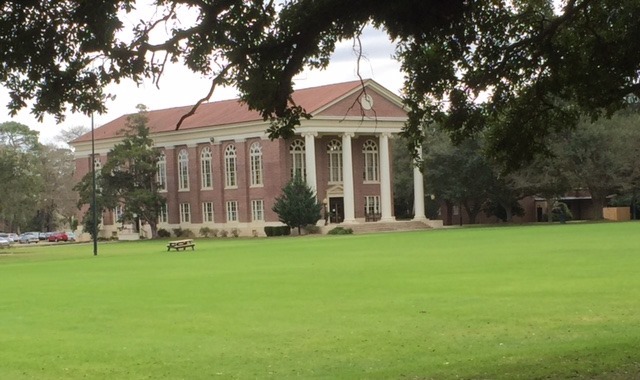 The campus was quiet as the students were still on break but it was beautiful and I loved running thru campus. 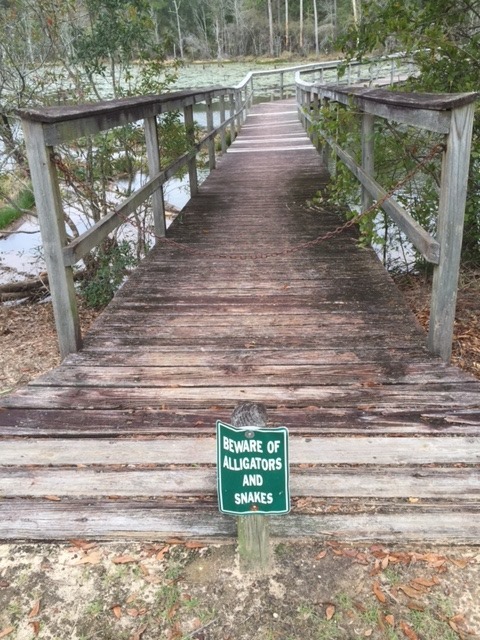 Plus, I’m happy to report that we did not see any alligators OR snakes. The course also had a lot of bike support. The bike riders where constantly riding around us, talking to us, checking on us and offering support. One bike support person even offered us a Cliff Bar when we were feeling particularly famished. It’s REALLY hard to anticipate how many calories your body will need on Day 2 of a 2 day marathon challenge. I was hungry. Julie was hungry. We kept eating. And we were still hungry. The aid stations here were different than most. Normally the race officials can tell you exactly what will be on course and where you can find it. Not at First Light. The aid stations were all sponsored by different people, companies, and/or running clubs. So they got to pick what they served at the aid stations. Although there was not one gel on course, we received oranges, bananas, donuts, pretzels, potato chips, candy, pickle juice, chicken broth and I was even offered at shot of Corona, which I politely declined. It was a great experience. The aid stations were all well staffed and everyone thanked us for running. In all, this is definitely one of my favorite marathons so far & this was #28 (State #17) in case anyone besides myself (and Julie) are counting. I’d highly recommend it to anyone. It’s scenic. Fun. Relaxed. And lacks the hype and hoopla that so many races put forth. The race fee is low. I paid $52.15 with service fee to register in April for the January event. They offer a gender specific tee, chip timing & a unique hand crafted finisher’s medal. If you decide to try the Back2Back Challenge, you can hop a bus from Jackson to Mobile and First Light takes care of all the Back2Back awards/swag. Swag below, plus a close up of the handcrafted finisher medal & a couple pics of the Back2Back medal which was a spinner. Different on both sides. A note on the Back2Back Challenge. I know its not for everyone. I certainly wouldn’t recommend 2 marathons in 2 days in 2 different states to many but I had a lot of fun. We took it super slow (5:09 on day 1 & 5:06 on day 2). We walked, sang, laughed & joked our way thru the miles. I must say it was easier than I anticipated. I was fatigued but nothing that was insurmountable. 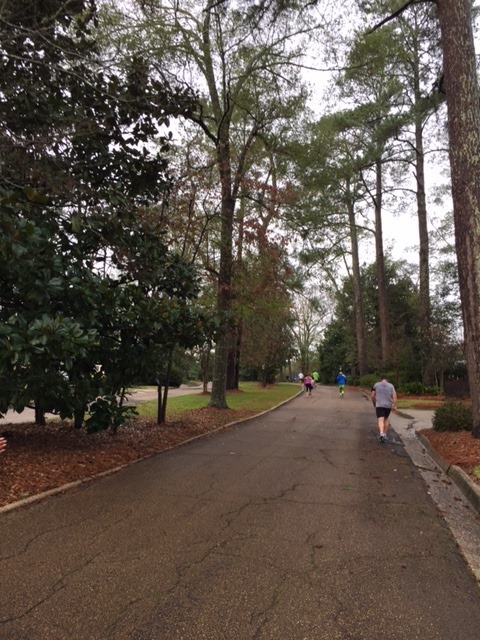 If you have gone for a shake out run, or a “recovery” run, the day after a long run or marathon, then you know that the first few miles you might be tight but for the most part everything loosens up and those little aches and pains work themselves out. The hills in Jackson and the slant of the road in both towns did provide me with some aches that I normally do not get. But thanks to my Injinji socks, I didn’t get any blisters until day 2 and then I only had 2 tiny blisters when I finished First Light. Not bad for 52.40+ miles in 29 hours. If you need a winter marathon, or one in Alabama, put First Light on your list. It’s not fancy but they give you everything you need and more, plus rice & beans, pasta salad, cookies, hot chocolate & beer at the finish. All which can be enjoyed while listening to a local band. Great experience. I’d got back and do it all again if the schedule allowed. Last year at this time, I could hardly walk. The Plantar Fasciitis Devil had a firm hold on both of my feet. I could move once I got warmed up but if I tried to run, I would tighten up after a few miles and normally be stopped in my tracks. If I tried to “push thru”, I would be rendered useless for days. I would tighten up when I would sit down. Or go to bed. Or drive in the car. Walking was nothing but excruciating to the point that my non-runner (and generally unsympathetic) hubby would walk thru the house multiple times a day to clear the floor of toys, dog bones, debris or anything on which I could accidentally step because if I stepped on anything, I would crumple to the floor in pain. I wish I were exaggerating but if anything, I couldn’t possibly give an idea of how badly I was hurting if you have never experienced the deep grips of Plantar Fasciitis. For all who witnessed my pain, or if you asked my hubby or the slew of Physical Therapists, Orthopedic/Sport Med docs and Chiros that I saw when I moved to Indiana, the idea of me running “much” in the future was slim to none. 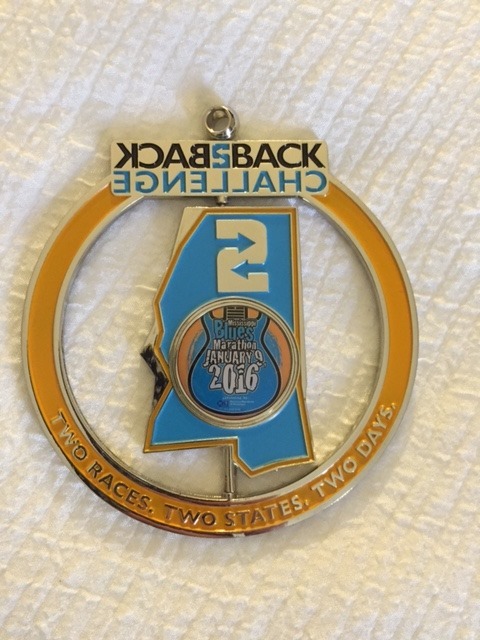 I was scheduled to run the Back 2 Back Challenge 2015 which was the Mississippi Blues Marathon & First Light Marathon double, but I could not do it. I mean, I couldn’t walk, I certainly couldn’t run 2 marathons in 2 days. So, I deferred my entries to 2016 with a hope and a prayer that I could get the PF under control within a year. And I did, thanks to some amazing Chiropractors at Optimum Performance in Ft Wayne, IN. HUGE shout out of thanks to Dr. Russell & Dr. Goins for everything they have done for me over the last year. And for not taking the easy way out by just saying, “stop running”. For the record, as of today, I am pain free. Like zero pain when I walk or run or get up out of bed. Pain free. And I am beyond grateful. So, the Back to Back Challenge was a GO for 2016. 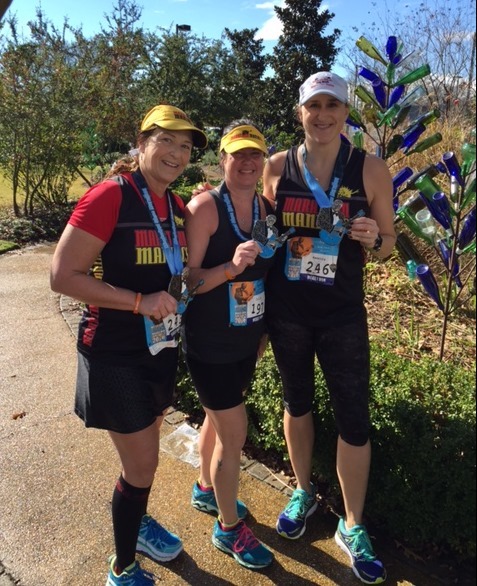 The Mississippi Blues Marathon was Saturday, January 9, 2016 in Jackson, MS. 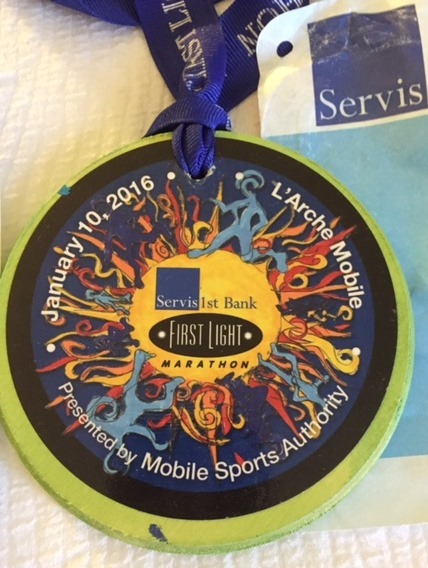 The First Light Marathon was January 10, 2016 in Mobile, AL. Let’s talk about MS Blues today! 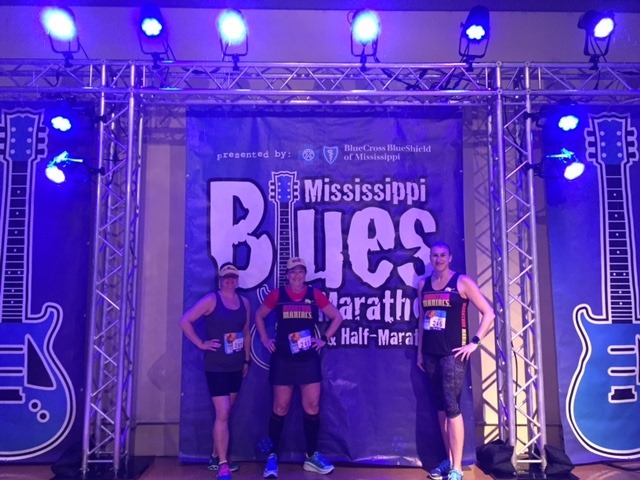 MS Blues offered a small expo at the Jackson Convention Center and easy packet pick up before the race or even on race morning, if necessary. Parking was easy and free. Packet Pick up was fast and painless. 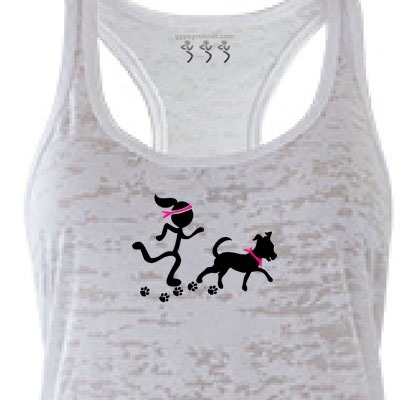 We even spotted and shopped with our favorite marathon runner and expo booth, Gypsy Runner. Thanks for hooking us up with some cool stuff, Amy! 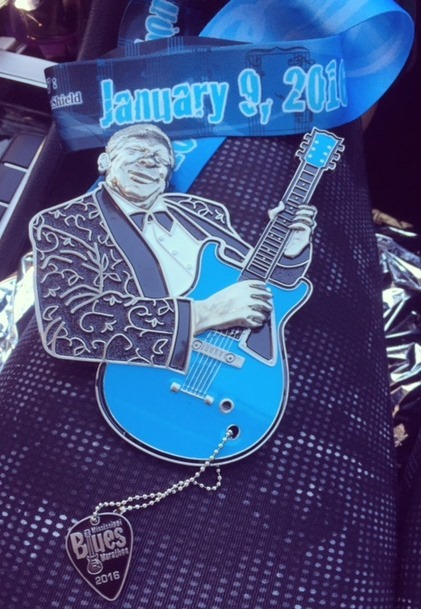 This year’s race was all about honoring BB King who passed in 2015. 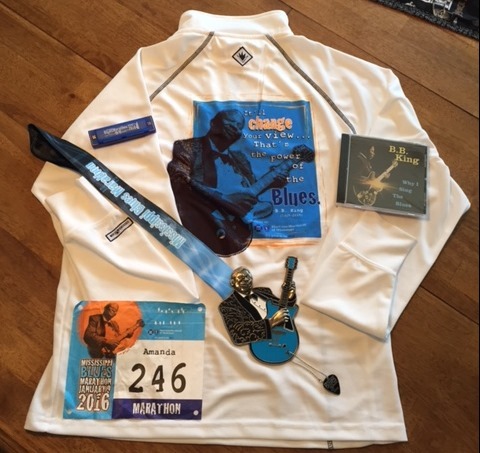 They put a BB King CD in each of our race packets. 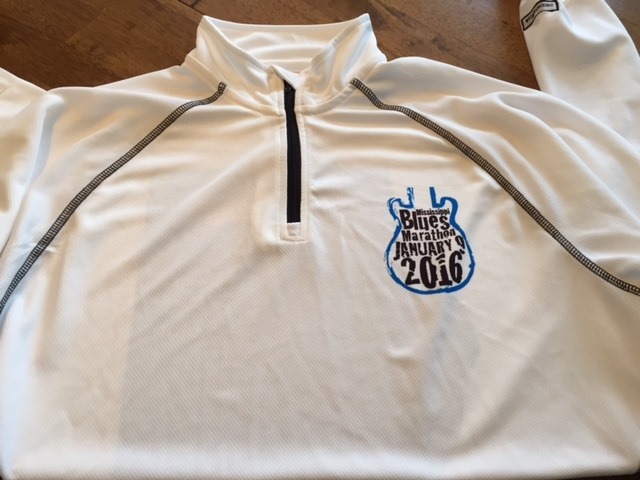 We also each received a harmonica with the date/logo of the event & a cool unisex 1/4 zip with BB King on the back. Great swag. 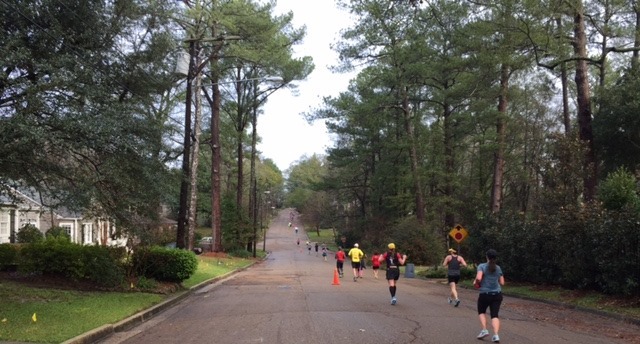 If you’ve talked to anyone about the MS Blues Marathon, you’ve probably already heard about the hills. So let’s just get that out of the way right now. This race is hilly. And I don’t mean maybe. Very hilly. I think Judy said that we climbed over 5500 feet in elevation over the course of the race. And descended about the same. So many ups and downs on this course. Pretty much non-stop. But it was beautiful. 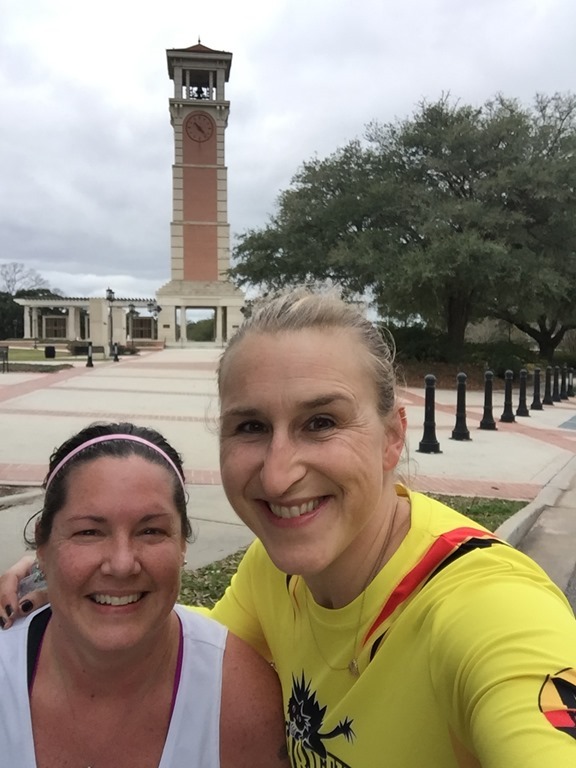 Great course thru stunning neighborhoods, amazing homes, great volunteers and police who were actually smiling and thanking us for coming to run their city. Small race, with approximately 755 marathon finishers, 1871 half finishers, 307 Quarter Note finishers & 28 relay teams. We had a lot of fun, even with the rain. 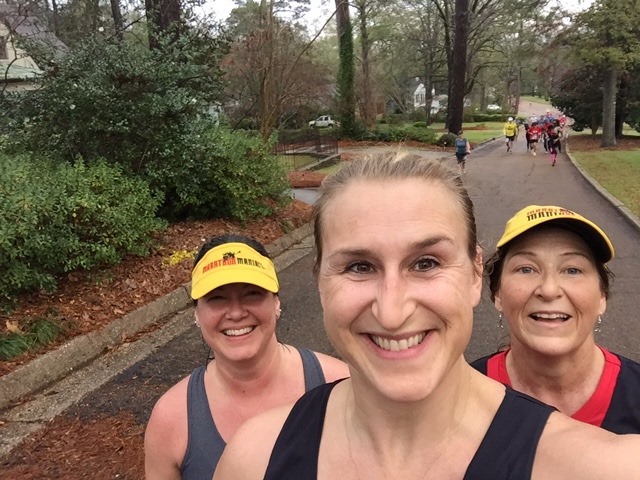 We started in the rain and finished in the rain. In fact, there was as much rain as there were hills, maybe more. Steamy pic of Julie, Judy & I under the lights pre-race. Pic of some of the course below. Hello hill (pic 1). MS Blues really does it right and we really enjoyed ourselves. They focus on the Blues element of this historic area. In fact a portion of the proceeds from the race go to the local Blues Foundation. Generally this race has a 9 different spots for live performers on the course but the weather was bad this weekend. There were a few spots where we heard music but nothing like there would have been had it not been down pouring rain most of the day. We finished. 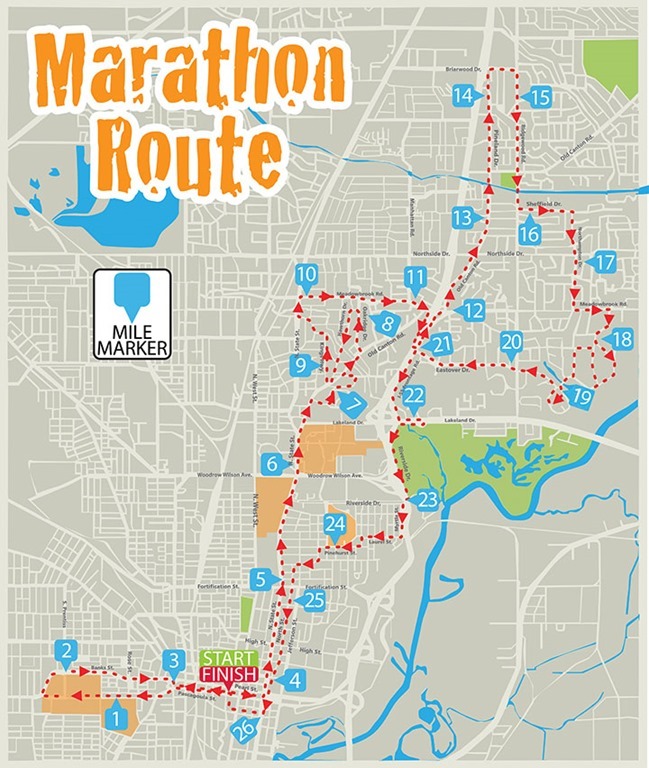 It was very slow going in the beginning because the streets just could not accommodate the number of runners. We were really packed in tightly for several miles. Not a problem for us but if you want to race this, then plan a slow start or head to the front! We just took it super easy and walked a lot of the hills since we were headed to Mobile AL for another marathon on Sunday. We finished in 5:10 (factoring in way too many potty stops and a lot of hill walking) and the sun had finally came back out, minutes before we crossed the finish line. Yay for the sun. Judy, Julie & I at the finish. Very cool BB King medal with a hanging guitar pick. There was a finisher party with food & music but the music wasn’t playing and the food was gone when we got there. Supposedly more food was the on the way but my tummy was already upset so we waited a half hour and then left to get cleaned up and back on the road for the trip to Mobile, AL. If you can hang out in Jackson after the race, there is a very popular Blues Crawl that takes you to some of the local music venues in Jackson post race. There is also a Blues Trolley that does the driving in case you want to have a beverage. We missed the fun but I heard that it’s amazing.